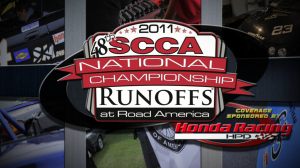 Sunday News show coverage from the 2011 SCCA Runoffs Championships coverage brought to you by Honda Racing HPD. | GoRacingTV | Racing Videos and Racing News! GoRacingTV.com » All Videos » Video Programs » 2011 SCCA Runoffs - Daily News » Sunday News show coverage from the 2011 SCCA Runoffs Championships coverage brought to you by Honda Racing HPD.